DRF1276DM is a type of 868Mhz/915MHz long range low data rate data radio modem based on SX1276 from Semtech. 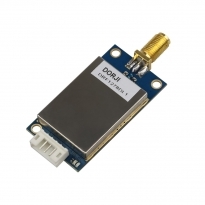 DRF1276DM is a low-cost sub-1 GHz transceiver module designed for operations in the unlicensed ISM (Industrial Scientific Medical) and LPRD bands. 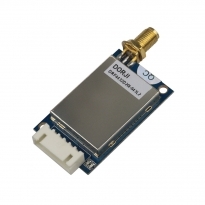 Frequency spectrum modulation/demodulation, multi-channel operation, high bandwidth efficiency and anti-blocking performance make DRF1276DM modules easy to realize the robust and reliable wireless link. 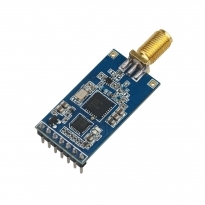 DRF1278DM is a type of long range TTL interface data radio modem based on SX1278 from Semtech. DRF1278DM is a low-cost sub-1 GHz transceiver module designed for operations in the unlicensed ISM (Industrial Scientific Medical) and LPRD bands. 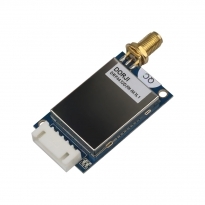 Frequency spectrum modulation/demodulation, multi-channel operation, high bandwidth efficiency and anti-blocking performance make DRF1278DM modules easy to realize the robust and reliable wireless link. DRF1278DL2 is a type of long range RS485 interface data radio modem based on SX1278 from Semtech. 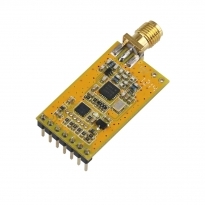 It is a low-cost sub-1 GHz transceiver module designed for operations in the unlicensed ISM (Industrial Scientific Medical) and LPRD bands. Frequency spectrum modulation/demodulation, multi-channel operation, high bandwidth efficiency and anti-blocking performance make DRF1278DL2 modules easy to realize the robust and reliable wireless link. DRF4432D20I-L2 is a wireless RS485 interface module designed for operations in the unlicensed ISM (Industrial Scientific Medical) and LPRD bands. FSK (Frequency Shift Keying) modulation/demodulation, multi-channel operation, high bandwidth efficiency and anti-blocking performance make DRF4432D20I-L2 modules easy to realize the robust and reliable wireless link. 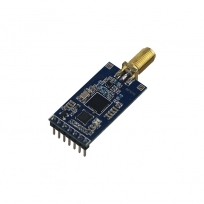 DRF4432D20 is a low-cost sub-1 GHz transceiver module designed for operations in the unlicensed ISM (Industrial Scientific Medical) and LPRD bands. GFSK (Frequency Shift Keying) modulation/demodulation, multi-channel operation, high bandwidth efficiency and anti-blocking performance make DRF4432D20 modules easy to realize the robust and reliable wireless link. DRF1278DL1 is a type of long range RS232 interface data radio modem based on SX1278 from Semtech. It is a low-cost sub-1 GHz transceiver module designed for operations in the unlicensed ISM (Industrial Scientific Medical) and LPRD bands. Frequency spectrum modulation/demodulation, multi-channel operation, high bandwidth efficiency and anti-blocking performance make DRF1278DL1 modules easy to realize the robust and reliable wireless link. DRF4432D20I-L1 is a wireless RS232 module designed for operations in the unlicensed ISM (Industrial Scientific Medical) and LPRD bands. FSK (Frequency Shift Keying) modulation/demodulation, multi-channel operation, high bandwidth efficiency and anti-blocking performance make DRF4432D20I-L1 modules easy to realize the robust and reliable wireless link. DRF4463D20-A1 is a 3V data radio modem based on RFIC SI4463 from Silicon labs. GFSK modulation /demodulation, multi-channel operation, high bandwidth efficiency and anti-blocking performance make DRF4463D20-A1 modules easy to realize the robust and reliable wireless link. 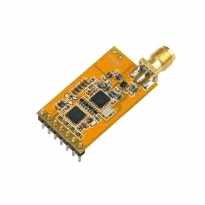 DRF4463D20-A2 is a 5V data radio modem based on RFIC SI4463 from Silicon labs. GFSK modulation /demodulation, multi-channel operation, high bandwidth efficiency and anti-blocking performance make DRF4463D20-A2 modules easy to realize the robust and reliable wireless link.